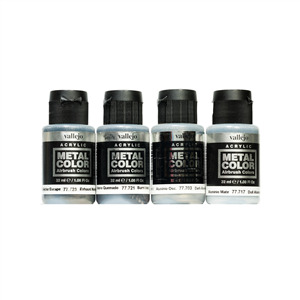 a new range of Metal Colors from Vallejo, they are water based but you can achieve a very shiny and realistic finish with them. They dry very fast, set rapidly, tack resistant in 15 minutes, they accept Tamiya masking tape without problems. Always use gloss black primer to achieve an extra realistic and shiny finish.